Two most versatile actors of Bollywood Sushant Singh Rajput and Bhumi Pednekar have come together for the very first time to star in Abhishek Chaubey’s Son Chiriya. 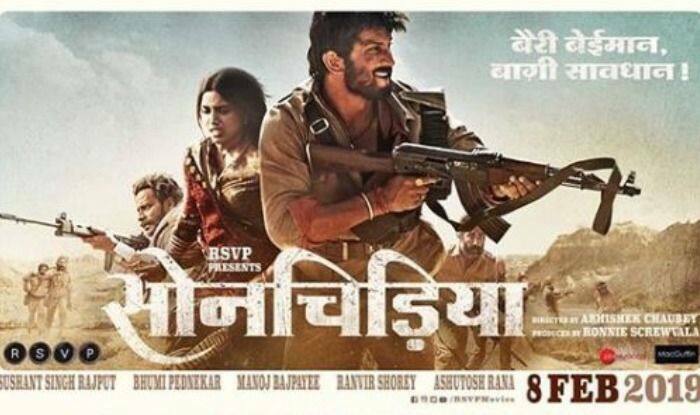 A new poster of the film has been unveiled today which features Bhumi, Sushant and Manoj Bajpayee in their rugged avatars. The makers will be releasing the trailer tomorrow and this intriguing poster has left the fans excited. Bhumi started her career in Bollywood with Dum Laga Ke Haisha (2015) with another versatile actor Ayushmann Khurrana. In the film, she played the role of an overweight intelligent girl who got married to an unemployed small town boy. Her performance was acclaimed and was also awarded the Filmfare Award for Best Female Debut. Son Chiriya is all set to release on February 8, 2019.